April is National Autism Month. Autism is a neural development disorder characterized by both verbal and non-verbal communication impairments, hyper focus on narrowly restricted areas of interest and repetitive speech patterns and behaviors. The number of children diagnosed with autism has been increasing dramatically since the 1980’s and the prevalence of children on the autism spectrum is currently thought to be approximately 1 in 88. Typical treatment programs focus on behavior modification, structured teaching, speech and language therapy and social therapy. Various medications are also used to treat problems associated with autism spectrum disorders. However, there is currently no known cure. Many alternative therapies are available, including therapeutic riding programs. While research into equine assisted therapy is fairly new, anecdotal evidence shows that the effects of horseback riding on the behavior of autistic kids is often so powerful, that some children respond in ways that cannot be accomplished in any other setting. Equine therapy also provides therapeutic benefits to children with a wide range of other mental, physical and behavioral challenges as well. I recently had the chance to sit down with Cory Ramsey, Manager of the Equine Programs at Camp Cheerful in Strongsville, Ohio, to talk about their therapeutic riding program and the benefits of providing kids with meaningful experiences in nature. Elizabeth: Thank you for taking the time to talk to me today. Camp Cheerful has a long history of providing outdoor recreation to children with disabilities. However, the equine program has been a more recent addition to your camp programs, correct? Cory: Yes. Camp Cheerful always had farm animals here, including horses, but they formally became a therapeutic riding center in 2005. The program originated from families that were looking for the option of equine therapy and the camp staff recognized the need to formalize it. They made the decision to become an accredited riding center and started fundraising to build the barn. They went through the accreditation process with NARHA (North American Riding for the Handicapped Association), which is now PATH (Professional Association for Therapeutic Horsemanship). Elizabeth: Exactly how does a riding center become accredited? Cory: PATH has standards for all accredited centers that are members. We are required to be in compliance with the treatment of the horses, the safety of the client, instructors and the volunteers. The standards also include the certification process for instructors. They have to complete a written test, a lesson plan and teach a mock lesson to other students. They are required to physically ride a horse and are tested for their riding skills as well. Instructors also need to gain overall knowledge of cognitive, physical, emotional and behavioral disabilities so that they can better understand and serve the client. PATH does a preliminary site visit for the initial accreditation and then they come back every five years to ensure the standards are maintained. Elizabeth: Were you a part of the program since its inception? Cory: No. I came a year later. Elizabeth: What led you to Camp Cheerful? Cory: I was looking for a career path that would allow me to follow my passion, which has always been horses and children. About a year after the program started, I heard they had an opening for a Volunteer Coordinator, so I applied for the position and started out working part-time. Elizabeth: It takes a lot of volunteers to keep a therapeutic riding program running smoothly. One rider may require as many as three volunteers. I have always been amazed by the commitment and loyalty of the Camp Cheerful volunteers who return year after year to help out. I know you have since passed the responsibility of Volunteer Coordinator along to others, but you were the one who initially established and managed this incredible group of people. What’s your secret? Cory: Well, of course I’d like to take the credit, but in reality, it is just a matter of connecting with people. Initially, volunteers will approach us for their own reasons. Whether it’s that time in life to give back, whether they’re required to do service hours for school, have extra time on their hands or maybe they just love horses. There is something that initially draws the person to Camp and to our program. Once they’re here, I try to discover their interests, and cultivate those interests over time. So if there is someone that has always loved horses and never had the chance to be around them, I try to bring them in and help them to learn about the horse. Sometimes a student comes to do service hours for school and he or she may only need eight hours …and four years later they’re still here. I absolutely cannot take any credit for that. I attribute it to many things… the relationships that the volunteers have with the riders and also the bonds that are built between volunteers. Ultimately, I think it’s important to create a good positive culture so people feel welcome. They all come with different degrees of expertise in different areas and so we always want to make sure people are comfortable here and don’t feel intimidated. I try to bring everyone in and work to their strengths, help them with their challenges and educate them in areas that they have interest in. Elizabeth: Do they need special training? Cory: We provide a two-hour orientation to make sure that the program is what they are expecting. I always like to say that the orientation is their opportunity for an out. Volunteers must be age 14 and older and be able to walk for an hour. We also want to make sure that people understand the scope of the environment that they will be working in, and that they have the maturity to handle certain behavioral challenges. It’s amazing. There are families that become really close to certain volunteers. Some relationships have started here and continue on outside of Camp. Sometimes, part of the reason that the rider continues to participate in the program is due to a particular volunteer and part of the reason a volunteer continues to help out is because of the rider. Once they’re hooked…they stay. Elizabeth: That’s what you want, right? Cory: Yes. I love it! Elizabeth: There is a growing awareness that working with and riding horses can be physically beneficial to people. I have always loved horses and have been riding for years. When I was younger, I didn’t really think about my relationship with a horse. I was just having fun. It wasn’t until much later that I realized the special bond that I had formed with my horses throughout the years. What about you? How did your relationship with horses evolve? Cory: I’ve been working with horses since I was about ten. I was the little girl with the horses all lined up on the shelf. My aunt and uncle had a farm with ponies and a horse and I would go out there for hours. When I was twelve, I volunteered at Gibbs Farm, which is now Stearns Homestead in Parma, Ohio. After that, I started riding my aunt’s pony, and then took lessons. Later, we bought a horse…and the rest is history. Elizabeth: Was there a defining moment in your association with horses where you realized there was more to the relationship between horses and humans than just pure fun? Cory: I think I had an immediate connection, even before I started riding. I have always felt very comfortable around horses. At first, I played with my aunt’s ponies…going out there to groom and take care of them. I can’t describe it or put it into words, but it was just being around them, more so than the riding, that created the connection. Elizabeth: One of the misperceptions about equine therapy is that it’s merely a pony ride…that it’s a fun experience for the kids and nothing more. But there are also tangible physical and mental benefits associated with therapeutic riding sessions. Specifically, how does equine therapy help the rider? Cory: One of the main physical benefits is that the movement of the horse helps build trunk strength in a child with a physical disability. I’ve seen kids be able to sit up taller and reach further. I’ve had a mom that said, “My seventeen year old son can sit up on his bed while I change his shirt, and he’s never been able to do that in his life.” She attributes his progress to riding. For our kids on the autism spectrum, there are also psychological benefits to riding. These kids can be in an escalated state of behavior prior to getting on the horse for a variety of reasons. But once they are mounted, the swaying motion of the horse’s gait lulls them into a calmer state and allows them to focus more clearly. I have seen quite a few transformations. We support the child, but really it’s the horse and the rider that are creating that connection. Elizabeth: The parent of a child with a disability might ask how they can be sure that equine therapy is right for their child. Is there some sort of evaluation process that occurs before kids are admitted into the program? Cory: Yes. Initially, we do a telephone intake and ask them a series of questions to make sure that we are able to serve their needs. Then, we have the family come in, tour the barn and at this time we fit the child for a helmet. For some of our kids with sensory issues, wearing a helmet can be more overwhelming than being in the barn with a horse. During the physical intake process, we have them ride a horse for about fifteen minutes. At the conclusion of the evaluation ride, we sit down with the family to determine if this is a beneficial activity for their child. Once that’s gone well, we invite them into a time slot for a session of nine weeks. Throughout the nine-week program, we take progress notes and make sure that were meeting and adjusting goals that were set from the beginning. The family can be looking for social interaction for their child, conquering a fear of animals, increasing trunk strength or maybe just pure recreation. Sometimes, for a child who is in therapy all week, parents find that horseback riding is a way for them to have a release, make some friends, and do something fun that other kids can do. 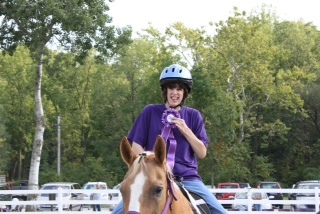 Elizabeth: With regard to autism, you recently built a sensory trail in the woods behind the barn, which seems to be particularly beneficial to riders on the autism spectrum suffering from sensory integration issues that make it difficult for them to understand their environment. What is a sensory trail and how does that support the equine therapy program? Cory: The sensory trail is designed to provide riders with a horseback riding experience that also stimulates their sense of sight, hearing and touch. We take them over a wooden bridge that makes a “clippity-clop” sound when the horse walks across it. There are different types of footing such as gravel and sand that the rider can hear and feel as the horse walks. There are tactile stations that are set up along the trail with various textures to stimulate the rider’s sense of touch and keep them interacting. The sensory trail also has fun activities to intellectually challenge kids, as well as provide them with the physical benefits of being on the horse. Elizabeth: Was there a reason for building the trail in the woods rather than putting it right next to the barn? Cory: It’s just an area to expand and offer more. The kids benefit from being outside. So by placing the sensory trail in the woods, we combined the therapeutic riding lesson with the experience of being in nature. Elizabeth: Even in the 1940’s, the founders of Camp saw the benefit of exposing kids to nature. Times have changed. Television, computers and video games take up a lot more free time. What do you see as some of the positive effects of nature on kids here at Camp Cheerful? Cory: One of the biggest benefits is that we get them outside. We’re able to point out deer, geese and all sorts of wildlife when we take them on trail rides. We do scavenger hunts, where we pick up leaves and look for wildflowers. We try to do some identification of the plants and wildlife on the property and in the park nearby. But as I mentioned, because a lot of our clients are in therapy all the time, Camp provides a welcome relief from that structured environment. In a camp setting, they’re outdoors and also reaping the therapeutic benefits of riding a horse. Their trunk strength is engaged, their coordination is engaged, but they are also experiencing nature which soothes many of our riders. When we’re outside, I often ask the class to just be silent and listen. This helps them to concentrate on the swaying of the horse and the sound of their feet on the ground. This seems to relax them. Camp also gives kids the opportunity and freedom to run around in the fresh air and wide-open spaces, play sports and participate in other physical activities. I think that our kids are seeing less and less of that these days, and it is recaptured here at Camp. 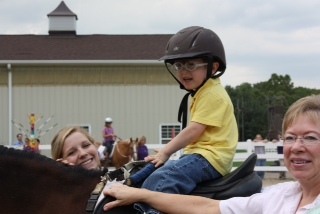 Elizabeth: What types of disabilities benefit from the therapeutic riding program? Cory: We have kids and adults with physical disabilities such as Cerebral Palsy, Muscular Dystrophy and Muscular Sclerosis. As I previously mentioned, we also have clients on the autism spectrum to varying degrees, and children with behavioral and emotional disabilities. Elizabeth: There is a sign inside the barn that reads, “Miracles Happen Here Everyday”. Do you have a particular success story that you would like to share? Elizabeth: What do you attribute that to? Cory: I think that the riders are enjoying the input that they’re getting from the connection to the horse, and they’re trying to give some sort of a response back. Cory: I know. It is hard to put into words. Elizabeth: I think you put it into words quite nicely. Thank you for your time. It’s always a pleasure to talk to you about the wonderful work you do here. For more information on Achievement Centers’ Camp Cheerful and the therapeutic riding program, contact the camp office at (440) 238-6200. The Achievement Centers for Children Camp Cheerful has been providing outdoor recreation programs for children with disabilities since 1947 and was the first camp for people with disabilities in the State of Ohio. Located on 52 acres in Strongsville, Ohio, and set amidst a picturesque valley in the Mill Stream Run Reservation of the Cleveland Metroparks, the camp offers a wide variety of opportunities to get kids outside and active, including the chance to ride a horse. Other traditional camp activities include hiking, swimming, fishing, canoeing, arts and crafts, nature study activities, games, campfire activities, music and sports. Camp Cheerful also offers a state-of-the-art, fully handicap-accessible High Ropes challenge course during camp sessions. Camp programs include Day, Residential and Weekend Respite Camps, as well as a Camp for Children with Autism.